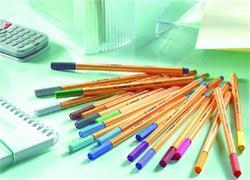 The universal fineliner for school children to professionals. The Point 88 is the Europe's number one fineliner. The only one available in 25 brilliant colors. Unmistakable hexagonal striped design. Metal-enclosed tip for a long lifespan. Suitable for use with rulers and stencils. Long cap-off time. Ventilated cap. Useful everywhere ­ at school, home, work.